The (geometric) thermal pools of the Termas Geometricas are just the right destination for those looking to relax in between hiking excursions. It is worth the trip for the drive to Coñaripe alone, which takes you through the beautiful landscapes along the southern shore of Lake Villarrica and later those of the north shore of Lake Calafquen. 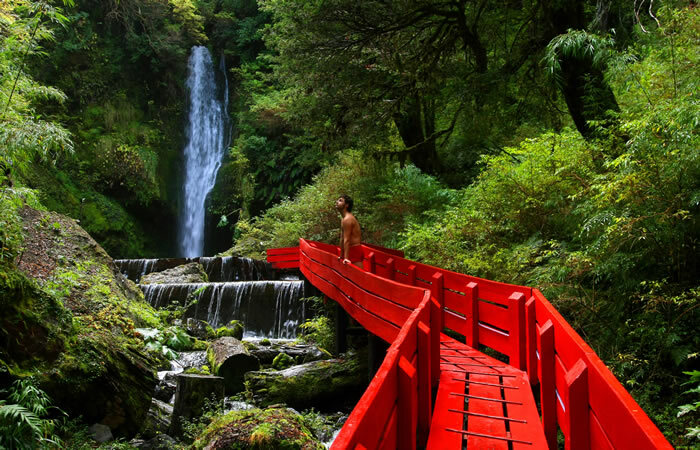 The Termas Geometricas are a very special place, located in a previously inaccessible ravine deep within the forest. Hot springs of 60ºC/140ºF to 80ºC/176ºF bubble up here, and 20 rustic geometrically-shaped pools, with temperatures ranging from 35ºC/95ºF to 45ºC/113ºF, have been built into the primordial setting to provide blissful swimming and relaxation. Wood walkways raised on posts run through the entire terrain, connecting the pools. During the day, you can enjoy the natural landscape of rock and forest; at night, lights and candles are lit along the walkways to create a very romantic ambience. This is one set of pools you are not likely to forget soon!